Apple Retail Stores will begin offering Square's iPad-based point-of-sale system, Square Stand, on July 9, reports 9to5Mac. 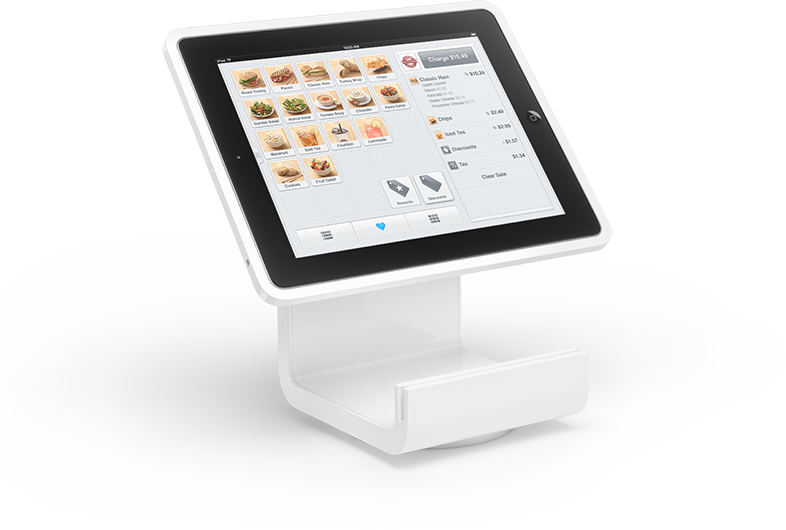 First introduced in May, the Square Stand is a cash register replacement that features both a secure iPad stand and an integrated card reader. It is also able to support additional peripherals like a receipt printer, kitchen printer, cash drawer, and barcode scanners. Unfortunately, the Square Stand is only able to function with iPads that use a 30-pin dock connector, making it compatible with the iPad 2 and the third generation iPad. Apple is expected to begin offering the Square Stand at a number of retail stores on Tuesday, July 9, and it will retail for $299. Does anybody have any insight into why they wouldn't support the Lightning connector? Is there a technical reason? I would guess that redesigning costs money, adding a licensed lightning adapter costs money, and the market for the product doesn't need that feature. After all, why would you buy the top-end iPad just to run a sales processing app? I hope it can be securely fixed to prevent toe rags running off with it. What happens if I want to pay w old cold hard cash? So what you are saying is that Apple now sells PoS products? Surely they could add a chicken pin reader to this? Another reason Apple products have great resell value. The newest ipad would be a waste for something that will see much abuse. I shop at a number of places that use Square to accept credit card payments. I find the small Square readers to be noticeably less reliable in reading magnetic strip cards than are the dedicated PoS terminals with more robust card readers in them. At one restaurant I frequent, the iPad is left with the reader sometimes unattended at their font desk, not a very secure method at all. So a system like this which is cheap (yes, $300 is dirt cheap) and can secure the iPad as well as providing a higher quality card reader is probably going to do well. As for the Europe/Non-US Chip-PIN folks, this isn't designed for you. Almost no one in the US has Chip-PIN cards. Until recently, without a great deal of effort, they were almost impossible to obtain here. It's the problem of inventing and then deploying widely a technology that has long-term downsides. The rest of the world, doing more copying rather than inventing, gets to learn from our mistakes (GSM is a prime example of where Europe took a technology we invented and made it much better). it's strange to see that they decided to go with the old 30 pin port than the new lightning port. IPad 2's are much cheaper, the interface is more well known and cheaper and business don't need zomg Retina. 1024 res is fine.